IIT has created a humanoid robot that could help in real-life disasters. 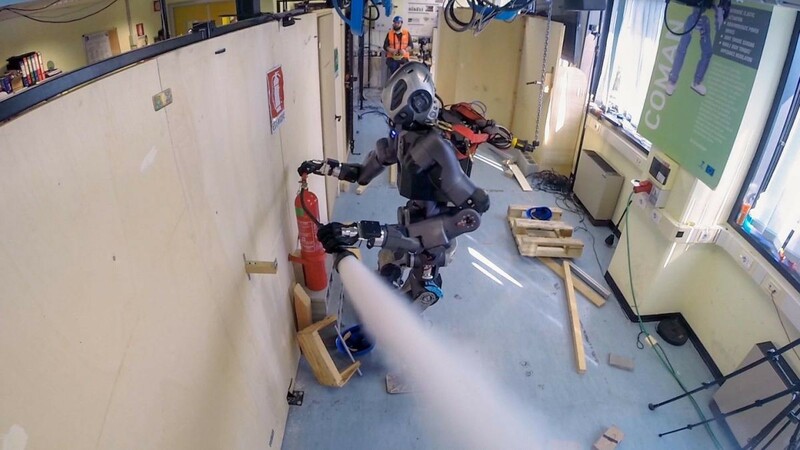 The Italian Institute of Technology’s (IIT) WALK-MAN robot is one step closer to helping humans in disaster situations. On February 22, IIT released a video showcasing an upgraded version of the humanoid bot. In the clip, WALK-MAN navigates a validation scenario designed to mimic an industrial plant following an earthquake. The room contains a hypothetical gas leak and fire. During the video, WALK-MAN performs four specific tasks. First, it opens a door and enters the room. Then, it locates and closes the valve responsible for the gas leak. WALK-MAN then moves debris (in the form of a few pieces of wood) before operating a fire extinguisher. Compared to the first version of WALK-MAN, which IIT unveiled in 2015, this version has a lighter, more compact upper body. It’s 1.85 meters (six feet) tall, weighs 102 kilos (225 pounds), and can carry up to 10 kilograms (22 pounds) in each of its two arms. According to an IIT press release, this design makes it easier for the bot to maintain its balance and navigate through narrow passages. It also improves WALK-MAN’s energy efficiency — the newly designed bot can operate for two hours using a 1 kWh battery. Unlike another door-opening robot, Boston Dynamics’ SpotMini, WALK-MAN isn’t fully autonomous. Instead, it functions as an avatar of sorts — a human wearing a suit equipped with sensors controls about 80 percent of its actions, WALK-MAN project lead Nikos Tsagarakis told IEEE Spectrum. According to Tsagarakis, the IIT team does hope to increase WALK-MAN’s autonomy so that it’ll be able to execute actions more quickly. Time is of the essence in disaster situations, so any improvements they make could have major implications if the robot is ever used during an actual disaster. In the robot age, are you sure you're a human? However, even in its present form, WALK-MAN could be a valuable addition to disaster teams as it would allow humans to use their intelligence to address a disaster scenario while keeping their bodies out of harm’s way.